It’s painful when male allies fail. But the success of so many female candidates is the other side of the story. The secret to sanity in the age of Trump is focusing on the resistance. Look beyond the doings of Robert Mueller and his lawyers—like Mike Pence, I too wish they’d “wrap it up,” but for totally different reasons—to the millions of newly energized Americans, most of them women, determined to resuscitate democracy in the wake of its stumble in 2016. Never has that felt more true than when liberal New York Attorney General Eric Schneiderman was forced to resign after four women accused him of abusing them. The resistance can’t afford to lose many allies, and Schneiderman was a putative ally. He had the power to prosecute the president, along with his family members and staff and other minions, for alleged business misdeeds that took place in New York, even if Trump used his pardon power to get those associates out of trouble with the feds. But given the serious allegations, Schneiderman had to go. It hurt—not just losing an ally, but also finding out he wasn’t the ally we thought he was. But the very next night came a reminder that while this #MeToo moment will bring down some political cads, it will also lift up some political heroes—and most of them will be women. In Tuesday night’s primary races in West Virginia, Ohio, Indiana, and North Carolina, “women trounce men,” Politico declared, winning 17 out of 20 races for open seats in the House of Representatives. Overall, two-thirds of the women running for House seats won. And of the 27 winners, eight are black women. There’s a big difference between the two parties, however: The 22 Democratic women who won on Tuesday will make up 55 percent of the House candidates on the ballot in those four states; the five Republican women who won will make up only 12 percent of their party’s contenders, according to the Center for American Women in Politics. All of this comes on the heels of the Texas primary last month, where 24 Democratic women either won outright or got into runoffs. Does Eric Schneiderman Prove We Should Never Trust a Male Feminist? The feminist PAC Emily’s List batted 1.000 Tuesday night; all 20 women it endorsed won their races. That included three House candidates plus four North Carolina state legislative contenders, and another 13 in Ohio. 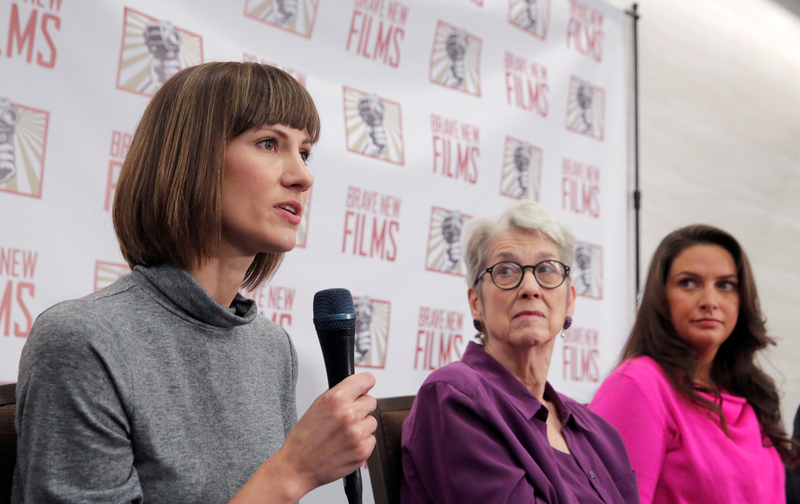 One of the Ohio winners, Rachel Crooks, is one of the 19 women who came forward to accuse Trump of sexual abuse before the 2016 election. Her district, southeast of Toledo, went heavily for Trump that year, and she’ll be in a tough race in November. But she’s attracting national support from “people who view me running as part of the anti-Trump movement that they want to support,” she told The New York Times. Many of the women who won Tuesday night, whether for House or state legislative seats, are running uphill races in fairly red districts. And yet, with help from a blue wave, at least some of them can win. Record numbers of women are winning state legislative races because record numbers of women are running. In Virginia last year, 11 of the 15 Democratic challengers who won seats in the state House of Delegates were women, some of them given little chance when they announced their candidacies. As state Democratic parties vie to become “the next Virginia,” they are fielding an unprecedented slate of female candidates. Here in New York, most of the candidates named as potential successors to Schneiderman are women, including progressive New York Public Advocate Letitia James and author and activist Zephyr Teachout. Meanwhile, the very able acting attorney general is Barbara Underwood. So when Trump gets you down, or another male Democratic ally stumbles, look around for a promising woman candidate to back. She’ll be easy to find. Coming up on Tuesday, May 15: A record number of women are vying to join Pennsylvania’s all-male House roster. One of them, Chrissy Houlahan, is among the unprecedented 34,000 women who have reached out to Emily’s List since the 2016 election asking for help running for office (by contrast, only 920 women did so the year before). Over lunch last year, Emily’s List president Stephanie Schriock told me she was blown away when Houlahan’s résumé, that of an Air Force veteran and former teacher, crossed her desk. “We were like, ‘Is this some sort of joke? Yes, of course we’ll help you run for Congress,’ ” spokeswoman Julie McClain Downey told the Huffington Post. Houlahan is the kind of candidate Emily’s List has worked hard to recruit in years past, and they haven’t always succeeded. But now here she was, volunteering and asking for help. It was a sign, Schriock knew then, that Trump had energized women—not just as volunteers or donors, but as candidates—like never before. Houlahan is given a decent chance of knocking off incumbent Ryan Costello in November. Four other Pennsylvania Emily’s List endorsees are on the ballot Tuesday. Here’s hoping for more good news for women that night, because in this ever-grimmer news cycle, we’re sure to need it.